Into every life, yadayadayada. But, it was ridiculous today. It’s our last day in Cayuga Lake State Park, which we think may actually be pronounced Q-GA (at least that’s what we heard somebody say). We feel rather ridiculous for pronouncing kai-oo-ga up until today. How would we know? Decided to take a trip to Montezuma National Wildlife Refuge to see if we could spot any unusual birds. Apparently, we were there at the wrong time of day to see much of anything. A few great blue herons, an egret or two, and tons of geese. Or, maybe we just weren’t patient enough. In the darkening clouds, we made the rounds thru the scenic drive (we were bummed that we couldn’t WALK thru this area – you have to drive). Doesn’t that seem a bit crazy? But, if we ever pass thru this way again, we would certainly give it another chance. 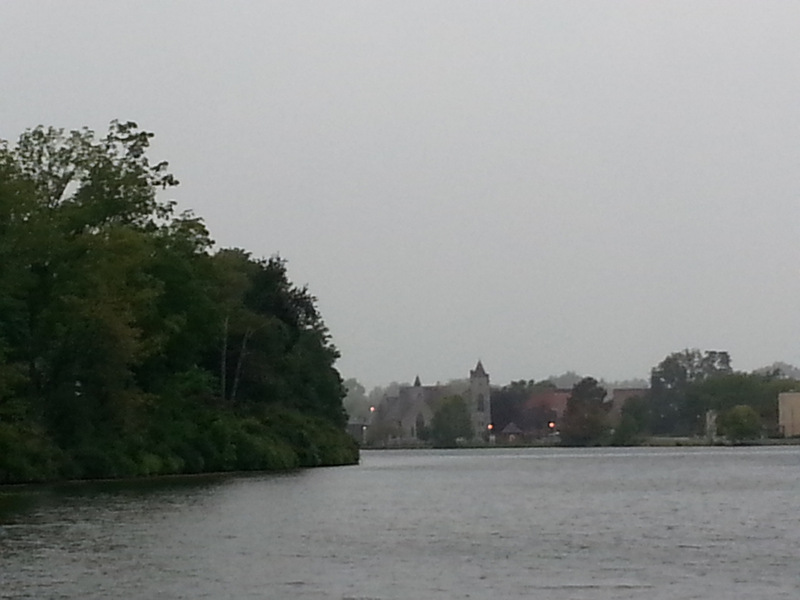 Ventured back into Seneca Falls, to see the locks on the Seneca River. 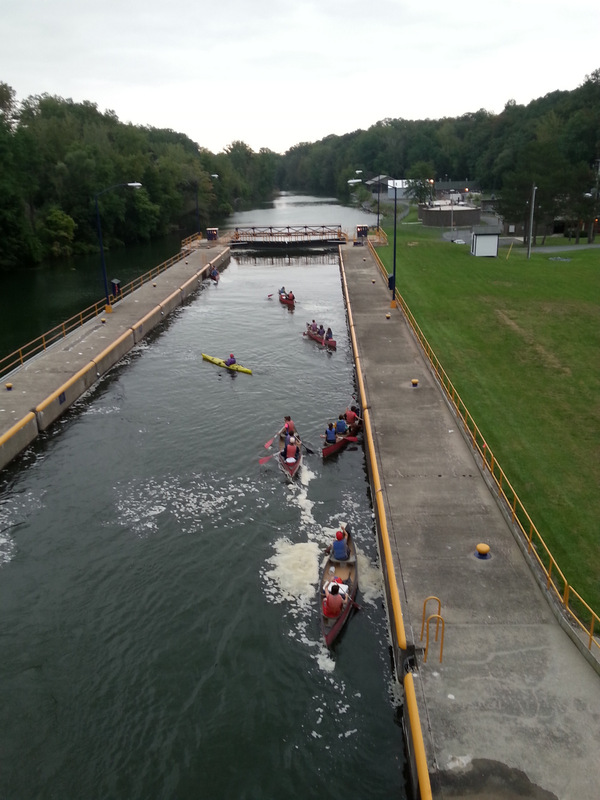 Fortunately for us, there was one boat and several canoes and kayaks passing through at the same time. The boat was going from low to high, and the canoes/kayaks the opposite. 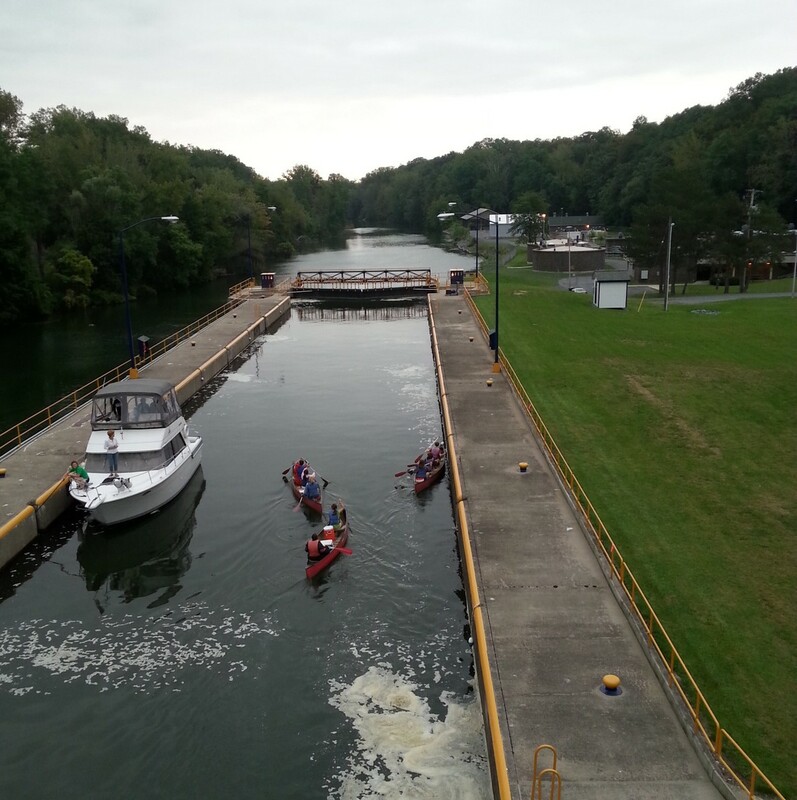 We could hear excited little kid voices coming from down below our view inside the locks – couldn’t quite figure it out until we saw them in the canoes. Canoes and kayaks all have to wait for water to drop to level of river below. Interesting to see this all come together. The rain really began in earnest as we stood there watching, and we made tracks back to the truck before getitng soaked. I fear that the boaters and kayakers didn’t fare quite as well today. The rest of the day was spent with our noses in books, waiting out the rain. We’re not quite out of the woods yet in that department, but hoping for the best for our travel day tomorrow to Putnam Pond SP in the Adirondacks. I have never seen locks in person. That would have been fun to watch. Wishing you sunshine and blue skies tomorrow! We manage to get in our fair share of naps, too. It was surprising to see how many campers left yesterday. Can’t believe they don’t know how to deal with one day of rain.